To know what size hat to order you need to measure your head by using a tape measure. If a tape measure is not available, use a piece of string, and write down the inches for conversion to the size. Here's a "Hat Size Chart" to help you out. Made out of Guatemalan Palm Leaf. This hat is a designed Replica of the hat worn by the late Paul Newman in the film “BUTCH CASSIDY AND THE SUNDANCE KID”. Comes with a leather hatband and Pewter star Concho side piece. Dyed to a light brown with a 3” brim and 4 1/4” crown. Sizes from 6 7/8 to 8 available. Styled after the hat beloved Character and Side Kick Actor George "Gabby" Hayes wore in many a Roy Rogers movie, this reproduction says it all. Ride the trails with "Gabby" , Roy, and Trigger with this one. Perfect hat for the unassuming Photographer, or Videographer. The brim will never be in the way. Just ask the photographer that took this picture...., Larry Futrell. HAPPY TRAILS!!! Available in sizes 6 7/8 to 7 3/4. 100% high grade Wool Felt. Color is Dark Brown. Equipped with Stampede Strings. 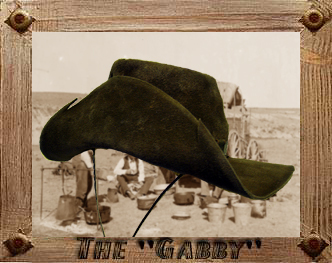 Finally,The brim is cut with slashes and sweat stains and dust show hours GABBY has being on the trail. Re-live the days of "Gunsmoke" with Marshal Dillon with this one. 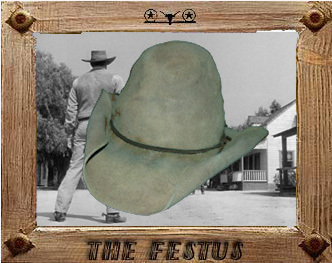 This high grade 100% Wool Felt hat is taken through a secrete dying process, and antiqued to Festus' liking. This one will turn heads. Comes with a plain latico lace band to get the point across!! Sizes 6 7/8 to 7 7/8 available. Sometimes, a hat comes along that is so unique and impressive that a Custom Hat Designer such as LONGHORN HATTERS has no choice but to offer it with its own family of Custom Designed Hats. 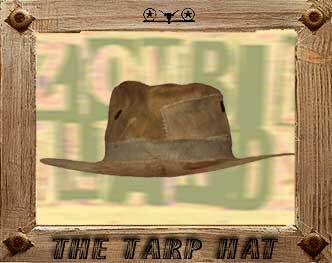 THE REAL DEAL TARP HAT is such a hat. This hat is hand made in a little Brazilian town from recycled truck tarps. Even the wire in the bendable brim was pulled from old truck tires. NO HAT IS THE SAME!! An entire Bio and Promo material comes with your REAL DEAL TARP HAT. Another hat added to the Clint Eastwood collection of film hats is "THE JOSEY WALES" from the film "THE OUTLAW JOSEY WALES". 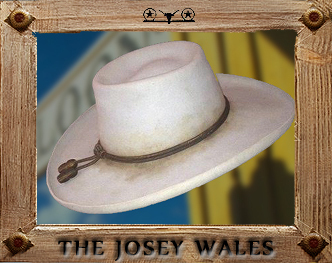 "THE JOSEY WALES" is hand made from a raw hat body in 100 % high grade WOOL FELT, and comes with a 4 1/2" rolled brim, and a 4 1/2" Telescope Crown. It is antiqued with road and battle wear and is adorned with a Military "Combat Knotted", battle worn rope hatband. Color is Silver Belly. 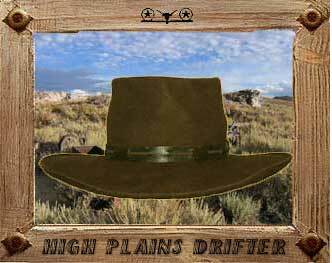 A replica of the hat worn by Clint Eastwood in his Spaghetti Western “HIGH PLAINS DRIFTER”. Even the 1 inch leather hatband is authentically styled. 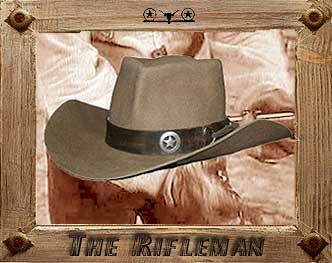 Dyed to a dark brown, this replica is designed right down to the dust, crushed, sweat stained hat worn by Mr. Eastwood. It is made of very heavy 100% Wool Felt, and sizes from 6 7/8 to 7 7/8 are available. Crown is lowered to 4 1/2", Brim width is 3 3/4" with a 1/4" pen roll. 50X Fur Felt BEAVER available upon request for $380.00 USD. 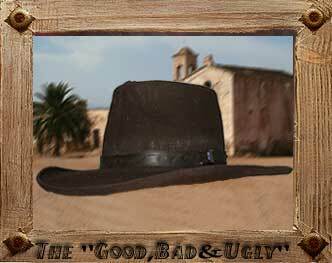 Another one of the hats worn by Clint Eastwood in his Spaghetti Western, “THE GOOD, BAD, AND UGLY” is this beauty. The 1 inch hand tooled leather hatband is authentically styled with the Silver Plated buckle on the side. A dark brown, this replica is designed right down to the worn crown and bullet hole, dust, crushed, sweat stained and pencil rolled brim of the hat worn by Mr. Eastwood. It is made of very heavy 100% Wool Felt, and sizes from 6 7/8 to 7 7/8 are available. The Tear Drop blocked Crown is lowered to 4 1/2 inches, with a Brim width of 3 3/4 inches.50 X Fur Felt BEAVER available upon request for $380.00 USD. You will feel like ROWDY YATES with this one!! Right off the set of one of the most popular Western Series (1959-1966) of TV yesteryear………, RAWHIDE starring none other than the iconic Actor….., Clint Eastwood. 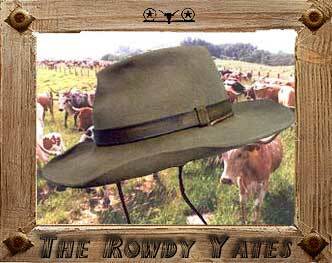 Done in High Quality 100% Wool Felt, THE ROWDY YATES will bless your head. It comes highly antiqued with range worn sweat stains, with front of brim edge raised 1/2 inch meeting sides. Back of brim edge is raised one inch like Rowdy wore it. A ¾ inch weather worn leather hat band, and rawhide Stampede Strings. Crown is 4 inches, and the brim measures 3 1/2inches. Sizes 6 ¾ to 7 ¾ available. NOTE: Why not make your "PALE RIDER" experience complete with "THE PALE RIDER FROCK COAT"......, check it out in the MERCHANDISE SECTION of the Web Site!!! From the Rocky Mountains of Idaho, rode "The Preacher" that starred Clint Eastwood in the 1985 film, "PALE RIDER"........., so the name of the hat..........., "THE PALE RIDER". " 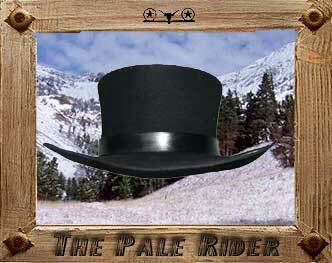 THE PALE RIDER" is made in 100% HIGH GRADE WOOL FELT BLEND. 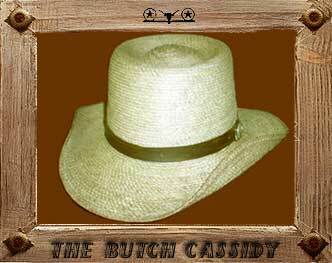 It is designed to spec with a custom 1 inch black leather hatband tied together on the side with black latico lacing. (Band is more of a FLAT BLACK with no glare than picture). This unique hat has a 4 1/2" flared crown, with a 3 1/2" brim. The hat is designed unnoticeably in two pieces to achieve the EXACT measurements and look of the hat "The Preacher" wore. Because of the extreme intricate technical design of the body of "THE PALE RIDER", plus fabricating and shipping time, there has been a four to six week delivery time frame placed on this hat. When you DO receive it however, you will turn heads!!! Many positive comments on this one!!! Sizes from 6 7/8 to 7 3/4 available. "THE BILLY JACK” as shown here, is styled after the hat worn by Tom Laughlin from the 1971 action film “Billy Jack”. The character, Billy Jack, that Tom Laughlin played was a "Half-breed" American Cherokee Indian, a Green Beret Vietnam War veteran, and a Hapkido Master. 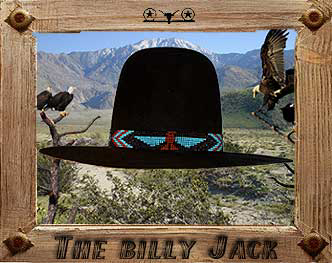 The brim of “THE BILLY JACK” is cut to 4” and the 6”crown is left open. The hatband is a red, black, and turquoise beaded hatband, THUNDERBIRD PATTERN, a legendary creature from American Indian Mythology meaning power and strength is sewed on to the crown. This hat will actually take you back to 1971 to Prescott, Arizona where “Billy Jack” was filmed. Available in sizes 6 7/8 to 7 7/8. From TV yesteryear, set in the 1880's in Northfork, New Mexico Territory, comes "THE RIFLEMAN" that starred Chuck Connors as Lucas McCain. This DYNA FELT Fur/Wool Felt blend hat is designed to spec with a 1 1/4 inch antiqued brown leather hatband with two Silver Conchos with a turquoise center piece, and held together with two D hooks and raw hide strapping. Color of the hat is called Sahara, a light brown tan. The hat is lightly antiqued, and comes with a 4" brim, and a 4 1/2" crown with a "Tear Drop" or "Single Peak" block. Seen here, Pewter Star Conchos are featured for the hatband. This hat was personally designed for Paul Sowa from San Antonio, Texas who requested this lay out instead of the Silver/Turquoise Conchos that normally are featured. Get your Bandana,The Old Time Cowboy Rio Grande Vest, Western Stitched Cowboy Shirt, Levies, and a pair of athhentic Lucchese Cowboy Boots along with "THE ROY BEAN TOPPER", and head for the COURT HOUSE. 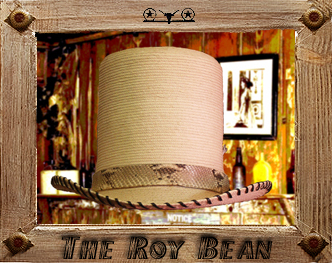 "THE ROY BEAN TOPPER" is made from Guatemalan Palm Leaf and comeswith a 1" Fitted Python Hatband, stitched brim with leather lacing, and a white side feather. The Crown is 7" tall, and the rolled Brim is 2 1/2" wide. If you think you are brave enough, THIS is the hat for you. Sizes 6 7/8 to 8 available. John Wayne portrayed U.S. Marshal Reuben J. "Rooster" Cogburn in the 1975 film, "ROOSTER COGBURN", which was a sequel to the 1969 film, "TRUE GRIT". “ROOSTER” was a one eyed, whiskey drinking, hell razin' Marshall, that because of his questionable use of firearms, always got his man. This black 100% high grade Wool Felt hat is a replica of the black hat worn. 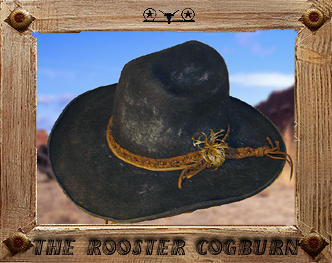 The 6 1/2" Crown, and 4 3/4" pin rolled brim is fully worn with dust, sweat, and grime from the adventures of "ROOSTER". Strings, and of course a black Eye Patch! Available in sizes from 6 7/8 to 7 3/4. THE DERBY is made from a 100% grade of Wool Felt, a very durable material. The bounded brim is 2 ½”, and the crown is 5 ¼”. 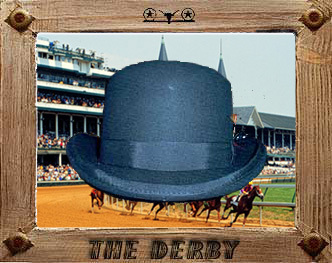 Along with a 1 1/4" ribbon hatband with a feather decoration, THE DERBY a perfect topper for any "Country Dandy". Perfect for any hat accessory for 1800 Western Re-enactors. Available in Black in sizes from 6 7/8 to 7 3/4. Ride into the West, and bring back yesteryear! Turn your hat into a range worn old cowboy hat right out of the old west. That’s right, LONGHORN HATTERS will turn your new or slightly used hat into a hat that looks fifty years old. All materials and colors are welcomed. Fur Felt, Wool Felt, Dyna Felt, and Straws. Contract Longhorn Hatters to turn your hat into a range worn, sweat stained, rain spotted, boot stomped, cow pattied, wind blown, horse kicked, river dunked, shot gunned shot, barbed wire cut, West Texas dust storm worn, bar room bashing, honest to goodness one of a kind story telling hat. For information regarding this unique service, contact Don Livingston at don@longhornhatters.com.